For today’s book review, I am taking a look at Stephen King’s Thinner. This is an exciting book for me because it harks back to my childhood when my older brother and I used to voraciously read anything my dad put in front of us. From westerns to love stories, adventure to mystery and suspense, we were exposed to worlds away from our mundane home in Zimbabwe. 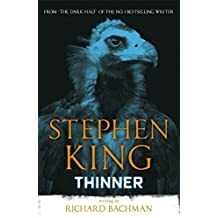 Thinner was one of the first books I read by Stephen King. I’m not sure how old I was at the time, but after reading Pet Sematary, I was looking for my next horror fix. My father had banned me from reading Cujo, he thought it was too frightening and violent for me at such a young age. I don’t think he knew that I had already read Pet Sematary! 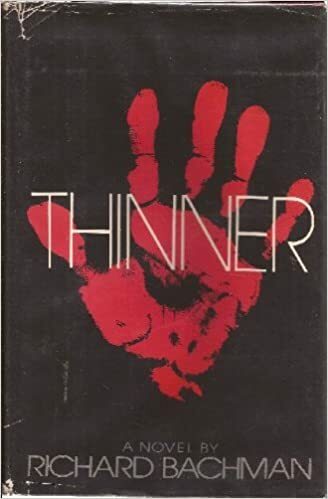 My brother handed me a copy of Thinner and I was struck by its plot: Billy Halleck, an arrogant lawyer who runs over an old gypsy woman whilst driving, due to his wife distracting him, escapes murder charges thanks to his ties with the judge and police involved. Angered by the lack of justice, an old gypsy relative of the murdered woman curses the lawyer and those involved. Billy curse is one word…”Thinner!”. His disbelief at first and then his ineffectual attempts to stop the process leads him back to the gypsies and finding a cure. The old gypsy man tells Billy that he should bear his own punishment but, if he wanted to be rid of it, he would have to give a slice of a special pie baked with his blood to the next victim of his choice. Choosing to give it to his wife, whom he blames for distracting him whilst driving, he awakes to find that his daughter and wife have eaten slices from the pie. In the end, Billy takes his slice and eats it, joining his family in their doom, thanks to him. 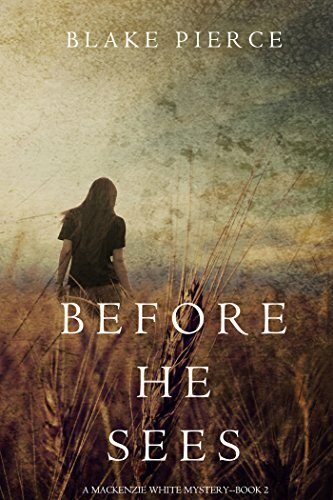 The story, written under the pseudonym of Richard Bachman and inspired by his own weight loss, leaves no sympathy for the main character, Billy Halleck. He is the epitome of our population; overweight, unapologetic and greedy for a quick fix. Though published in 1984, this book is just as relevant now as it was in the 80’s. With the politics and popular opinions flying this way and that in this world, we should be careful in case we become Billy Halleck. Who knows, there might be a gypsy out there ready to teach us a lesson on not facing up to consequences! If you would like to read Thinner by Stephen King, please click on the pic below. I do hope you have enjoyed this week’s Book Tuesday. Join me again next week for more of the same. Cecil and his friends are the best at playing pranks on others, especially their teacher, Mr Barns. But, after a seriously bad prank involving exploding Easter Eggs, Mrs Palmer, the Head Teacher, decides that Cecil and his minions have gone too far! The Police are called in and a specialist teacher is sent to the school to teach those badly behaved Year 6’s a lesson they won’t forget. You might remember her: the tall, thin woman with the raven black hair. Her name is Ms Crow and she has a knack of finding children that don’t behave. Will she teach Cecil and his gang a lesson, or will their pranks prove to be too much for Ms Crow?